SCOTTSDALE, Ariz. – Jan. 13, 2017 – To honor the World’s Greatest Collector Car Auctions®, Scottsdale Mayor W. J. Lane has officially declared January 14-22, 2017, “Barrett-Jackson Collector Car Auction Week” to commemorate the 46th annual event in the company’s hometown. 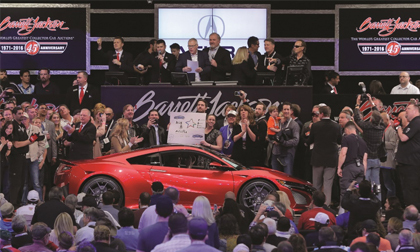 Barrett-Jackson has become a staple and a point of pride for the City of Scottsdale and its residents over the 46 years since its inception in 1971. Bringing both national and international attention to the city, in 2016 the annual event brought in more than 350,000 in attendance, with bidders from all 50 states and eight foreign countries. Having created a positive economic impact and raising over $91 million for local and national charities to date, the auction has become an important tradition for the City of Scottsdale and its residents. Barrett-Jackson’s 46th annual Scottsdale Auction will be held at WestWorld of Scottsdale, Jan. 14-22, 2017. To kick off the nine-day celebration, Barrett-Jackson will host Coca-Cola Family Value Day on Saturday, Jan. 14, with free admission for children under 12. The Automobilia Auction will begin on Saturday, Jan. 14; the invitation-only Opening Night Gala will be held on Sunday, Jan. 15; and the Collector Car Auction will begin on Monday, January 16. The week continues beyond the auction block with a variety of automotive and lifestyle activities, including the Coca-Cola Garage and Patio, Ford and Chevrolet Ride ’N Drives, Dodge Thrill Rides, complimentary “Behind the Hobby” Collector Car Symposiums, Arena Polo matches, an Arabian Horse Exhibition, Indian Motorcycle Demo Rides, hundreds of exhibitor and sponsor displays, and – new this year – a DIY Pavilion and the Shell Pennzoil Pioneering Performance Stage, where visitors can get in-depth looks at various aspects of the collector car world. Established in 1971 and headquartered in Scottsdale, Arizona, Barrett-Jackson, The World’s Greatest Collector Car Auctions®, is the leader in collector car auctions and automotive lifestyle events. The company produces auctions in Scottsdale, Arizona; Palm Beach, Florida; at Mohegan Sun in Connecticut, and Las Vegas, Nevada. With broadcast partners, Velocity and Discovery Channel, Barrett-Jackson will feature live television coverage in 2017, including broadcasts in over 100 countries internationally. Barrett-Jackson also endorses a one-of-a-kind collector car insurance for collector vehicles and other valued belongings. For more information about Barrett-Jackson, visit http://www.barrett-jackson.com, or call 480-421-6694.